Quiet neighborhood with excellent winter access. South facing sunny upstairs and downstairs. 6 person Jacuzzi on back deck through sliding glass doors -- overlooking mountain meadow and distant mountains. Sleeps up to 10 with off-street parking for up to 4 cars. Photos available upon request. Beautifully and completely furnished with all the amenities. 4 TVs with basic cable, 2 with DVD/VCR, 2 with Roku/Apple TV. Free WiFi Wireless Internet Access. Stereo with I-pod jack in living room. 3 bedrooms with queen beds. Air Hockey game in kids bunk room upstairs with 4 single beds and 1 double. Gas heat and separate glass-front wood stove that really cranks out the heat in winter. Plenty of wood split and stacked in woodshed. Winter snow removal service for drive-way and decks. Several children's snow sleds available. Grocery store and gas 1/3 mile away. Near ski areas, 8 miles to casinos and Lake Tahoe. Hi! My name is Chuck White and I have visited and lived at Lake Tahoe for over 40 years. I spent 30 years as a volunteer for the National Ski Patrol and have skied virtually every downhill resort and back country terrain in the Lake Tahoe area. I have hiked, fished and skied over most of the Tahoe Sierra Region. Tell me what you want to do during your visit to Lake Tahoe and let me "be your guide". I am a registered professional civil engineer and have been working for almost 40 years on environmental issues in California and the west. My wife Carrie and I live in Davis, CA -- most of the time. I originally purchased this property when I was living at Lake Tahoe in the late 70's and have maintained it as a second home and a rental property since 1982. Chuck's Tahoe Apache Cabin is ideally located in a quiet subdivision with great winter access and near both Heavenly Valley and Sierra-At-Tahoe Ski areas. Easy access to shopping and a myriad of outdoor activities. Unlimited Year Around Activities at Fabulous Lake Tahoe. The cabin is outfitted with everything you need to enjoy an amazing time at Lake Tahoe -- all within easy reach. Mountain meadow and forest view from back deck and hot tub. View Sierra over mountain meadow and US Forest land to rear. (4) Four phone on one circuit throughout the house. Central gas heating to all rooms. Wood stove in living room with wood in outside storage shed. Each bed is made and provided with towels. Extra sheets in labeled bins in closets. 2 car garage (for small cars or 1 large car). Up to 4 cars on driveway. No street parking !! Towels provided on each bed. Extras in Closets. Powerful WiFi covers entire property. Password posted in cabin. Gas Oven and Stove top. Cuisinart & others stored in bedroom closet. Microwave, blender, coffee pots, plenty of every kind of eating and cooking utensil you could ever need. Gas stove and oven. 3 large LCD TVs + 1 small CRT TV in bedrooms and living room. Basic cable with Roku/Apple TV on 3 LCD TVs. DVD + VCR in living room and bunk room. Books on shelves in each bedroom. Air Hockey and cabinet filled with many games and puzzles. (2) Dozens of DVD and VCR movies for both adults and children upstairs and down. landscaped lawn in front and back. back suitable for crocket and badminton. 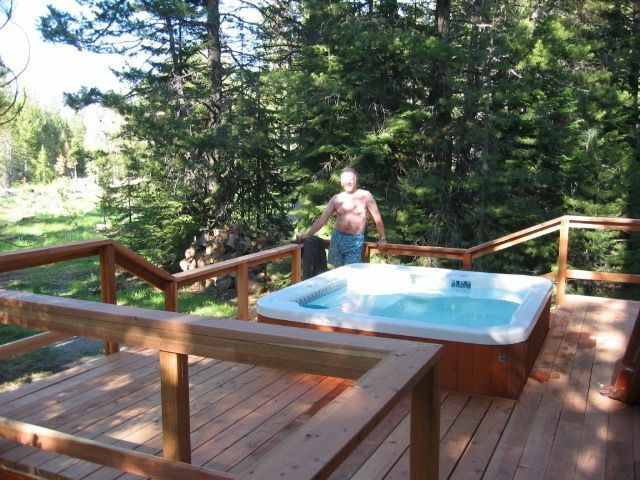 Balcony with hot tub spa overlooks Forest Service meadow and distant mountains. Large wrap around 2 level deck on 3 sides of cabin. Huge outdoor deck space with table, umbrella and plenty of chairs & benches in spring, summer and fall. Snowshoes and x-country skis in garage. Need to provide own boots. Rentals nearby. Heavenly Valley and Sierra-at-Tahoe are 20 minutes away -- Kirkwood 40 minutes away. There are 10 steps downs from the street level and garage to the front deck and sliding glass doors of chalet. Hot Springs spa can accommodate up to 6 guests year round -- 10 feet from rear sliding glass door. Set for 104 degrees. Completely furnished with all the comforts of home. 60 acres of forest service land out the back door. Excellent for hikes, x-country skiing, sledding. We had a great stay at Chucks’s Apache Cabin. Cabin was clean and well stocked with plenty of comfy beds to accommodate my large team. We loved the location and the Hot Tub! We were in town for a big event at Sierra-at-Tahoe and Chuck was so kind and accommodating to our many requests and needs. He went above and beyond to support us. We will definitely be staying here next year. Thank you Chuck! We had a great visit at this property. Easy to get to, close to everything in Southlake- but private enough to enjoy the hot tub and let the kids sled in the backyard. We would definitely stay here again. I love having families visit and enjoy Chuck’s Tahoe Apache Cabin — everything you need to enjoy your winter, spring, summer or fall escape to amazing Lake Tahoe. Reasonably priced. Natural setting — Secluded, yet accessible. Chucks place is wonderfully cozy and spacious. Any amenity necessary is available in the kitchen. Beds were comfy. The wood stove kept us nice and warm for our entire stay with plenty of wood and kindling. Close to SLT, Heavenly. Walking distance to the corner market and a friendly neighborhood. Will definitely be staying here again!!! Great cabin, fully stocked, good location. The location was great, the beds were comfortable, the wood stove was a champ - with firewood and kindling all ready, the spa was delightful, the art work and books interesting, and the kitchen was fully stocked, just as Chuck promised. All in all we couldn’t have been more pleased with our choice. Thanks, Chuck, for a great experience! We felt very comfortable here. Every attempt to make you feel welcome was made. The atmosphere was relaxing and comfortable. Great location to many amenities. We definitely recommend this cabin and will return again. Beautiful scenery and plenty of room in Chuck's cabin. Everything you need for cooking and BBQing and the hot tub was just what we needed. Sitting in the hot tub with a cocktail and looking out toward the forest was so relaxing. It was 20 degrees cooler at the cabin than our home, so very refreshing to have good sleeping weather. The 2 teenage boys had the 2nd floor to themselves with their own bathroom. The only downside is the upstairs beds are too small for 6 foot teenagers, but they made it work. Lots of shopping nearby and many beaches to choose from. According to the neighbor, he was visited by a bear cub with the mom bear nearby with 2 other Cubs. The beds are comfortable and the cool breezes were hypnotic. The cabin has everything you need, sheets, blankets, pots, pans, dishes, dishwasher, garbage disposal, washer, dryer, towels, cleaning supplies, paper products, BBQ and hot tub. Just bring clothes and your swimsuit. Our dogs enjoyed having different smells and we enjoyed having different views. The first morning waking up with a cup of coffee on the back balcony looking out to the forest was glorious, don't miss this affordable chance to visit Tahoe. Nearby, local casinos too. Chuck's Tahoe Apache Cabin is set in a rural mountain setting in Tahoe Paradise and Meyers district southwest of South Lake Tahoe, near the junction of Highways 50 and 89. Take nearby Pioneer Trail for 8 miles and you are at Stateline Nevada with Casinos! Six miles from Lake Tahoe, 20 minutes by car to Heavenly Valley and Sierra-At-Tahoe Ski Areas. Other Activities: x-country skiing. The Tahoe Paradise beach and tennis club is two miles away next to Upper Truckee River. Check out https://tahoesouth.com/explore/ for things to do in South Lake Tahoe area. *Refundable Damage Deposit to be returned in full within 2 weeks of departure provided no extraordinary cleaning or repairs. Good Standing Discount: Returning renters “in good standing” receive a 10% discount below applicable rates above.